NEW YORK/OAKLAND, Oct 28 2011 (IPS) - Barely a month after the first group of protesters set up its encampment in Zuccotti Park in New York City, the phrase “We are the 99 percent” has already become legendary. Used throughout the U.S., the expression has come to reference people who share what is left of global wealth after corporate CEOs and the “richest one percent” have pocketed the bulk of global output. But in a country still highly segregated along race, colour and class lines, the words “99 percent” continue to be points of contention for minorities involved in the movement. According to a new report released earlier this week by the Center for Social Inclusion (CSI), “Jim Crow still exists today in the (U.S.) job market,” with more black and Latino workers relegated to the realm of “second-class workers, over-represented in low-skill, low-wage occupations with limited chances to move up the ladder of opportunity”. The report says that people of colour and immigrants are systematically excluded from the job market as a result of underfunded public schools in their neighbourhoods, which in turn prevents many young minorities from obtaining a college degree. “People of color cannot get to job centers far from their homes due to inadequate public transportation services. Blacks, Latinos, Native Americans, and particular populations of Asians, live where employers don’t locate, where local and county governments have failed to build public transit, and where the tax base is too small to properly fund schools,” the report said. On Tuesday evening, a group gathered in Battery Park, just a few blocks away from Occupy Wall Street, to participate in a conversation about power and privilege. The discussion was organised by the people of colour working group (POC WG) for Occupy Wall Street, which has fought hard to insert a discourse of structural inequalities into the movement. “A month ago a group of people from South Asians for Justice went down to the General Assembly at Wall Street in time to hear the reading aloud of what would have become the first official document to be released publically, called ‘the declaration of the occupation of New York City‘,” Thanu Y, an organiser with the POC WG, told IPS. “We felt that language erased histories of communities of colour and immigrants in the U.S. and assumed we were all starting from the same point, economically and politically, when we came to protest this economic crisis – something we all felt was incorrect,” Thanu Y said. “Personally, I believe a discussion of those inequalities really needs to be at the forefront of this movement here in the U.S., and even globally, where realities of class and caste just cannot be ignored. The ways in which we are divided is part of the reason there’s an economic crisis in the first place,” she added. So the group decided to block the declaration from passing and stayed at the park till close to midnight, amending the declaration to better reflect the diversity of experience and privilege within the movement. Since then, the POC WG has been a major organising force in OWS, facilitating teach-ins, running a blog dedicated to “critical voices in the 99 percent” and linking up with groups like the Movement for Justice in El Barrio and Occupy the Hood to embrace and encourage minorities’ participation in the movement. Despite a brutal shutdown of the Occupy Oakland encampment on Tuesday, organising efforts are continuing in earnest in California, with increasing numbers of African Americans stepping up to continue the city’s legacy of struggle. The Black Panther Party was born in Oakland on Oct. 15, 1966. The city was also home to a strong black-led anti-apartheid movement and boasted the largest, strongest Rainbow Coalition chapter in the country. Today, over four decades later, Occupy Oakland has support from individual black Oaklanders, but hasn’t yet garnered unqualified support from two key constituencies: black ministers and black elected officials. To a great extent, there’s limited black participation because it’s a white-led movement, according to African American attorney and civil rights veteran Walter Riley. “Any time there’s a movement in this country that is primarily initiated by white people, there is a tendency for there to not be a large number of black people,” he said. “That does not mean that black people do not support it,” he continued, pointing out that the heart of the Occupy Movement – condemnation of the banks – is central to grievances within the African American community, namely, the lack of capital investment in black neighbourhoods and communities of colour. Oakland, too, represents the disparity within the 99 percent. The differences between white, black and brown joblessness is stark: in 2010, white unemployment was seven percent, while black and Latino unemployment was 19.6 percent and 15.2 percent, respectively. 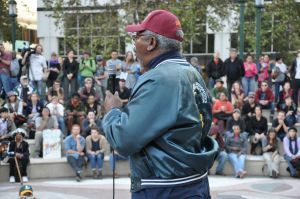 Riley said elected officials – including elected officials of colour – – should be in the forefront of Occupy Oakland, focusing on community needs. “I would like to see the City of Oakland expressly say, ‘let’s make [Occupy Oakland] work. Let’s keep it going,” he stressed. Alameda County Supervisor Keith Carson, also an African American, supports the anti-corporate message of the movement but called the leaderless structure “unsettling”. He said with other organisations, you know where to go to get information or who to talk to. That’s not the case with Occupy Oakland. And Carson said occupiers were sending the wrong message by camping in front of City Hall, when the real targets ought to be the banks. “Local government is under siege,” he said, underscoring that local government builds roads and provides for the health and safety of people in the city. Lack of strong black participation might be also understood in the shift in demographics. In the 1980s, 46 percent of Oaklanders were African American. Today, just 27 percent of Oakland’s population is black, while 25 percent is white, just slightly more than the Hispanic population. As Reverend Daniel Buford pointed out, now that the more affluent white community is hurt by unemployment and foreclosure, they have become leaders in the movement to fight the corporations and banks. The black church, he said, continues to do what it’s been doing all along – organising around bread and butter issues, particularly education that leads to good jobs. “We as clergy have a role to play, not just a role of protest, but of vision,” Buford said, adding that he supports concrete demands, such as the proposal in San Francisco to open a municipal bank. Buford said he helped organise an interfaith march on Monday in solidarity with Occupy San Francisco, where one group of marchers carried a golden calf to illustrate a biblical verse condemning “fiscal idolatry”. Clarence Thomas, executive board member of the International Longshore and Warehouse Union in San Francisco and a former Black Panther, stressed the need for the 99 percent to come together. He pointed out that one of the strengths of the Panther movement was its ability to develop coalitions with white allies, who were referred to at the time as “white radicals of the mother country.” He said he thinks this can happen in the Occupy Movement. “It’s a mistake to say, ‘this is a white youth-led movement; there is not room for people of colour,” he said, pointing to movements like Occupy the Hood in Chicago. “It is a matter of us getting involved in the process,” he said. “That doesn’t mean there won’t be bumps in the road, but anything worth fighting for is worth the sacrifice of struggle to work it out. The ruling class is depending on us not being able to come together,” he added. *This story is the first of a two-part series about the influence of race, colour and class in the U.S. Occupy movements. Judith Scherr reported from Oakland, California.